One of the nice things about working at MSSL is that the department consists not only of the building in which we work, but also the grounds in which it lies. This is particularly enjoyable during the summer, for example one can eat outside at lunchtime talking about science and looking at the amazing views for inspiration; if there is a long paper to read there are many places to sit in peace in the fresh air. MSSL also remarkably has a outdoor swimming pool (perhaps we will blog about that in the future), which is not too cold(! ), and nice to use on really hot days. The various lawns in the grounds are also put to good use, football is played regularly, and in the summer the department has a Croquet tournament! 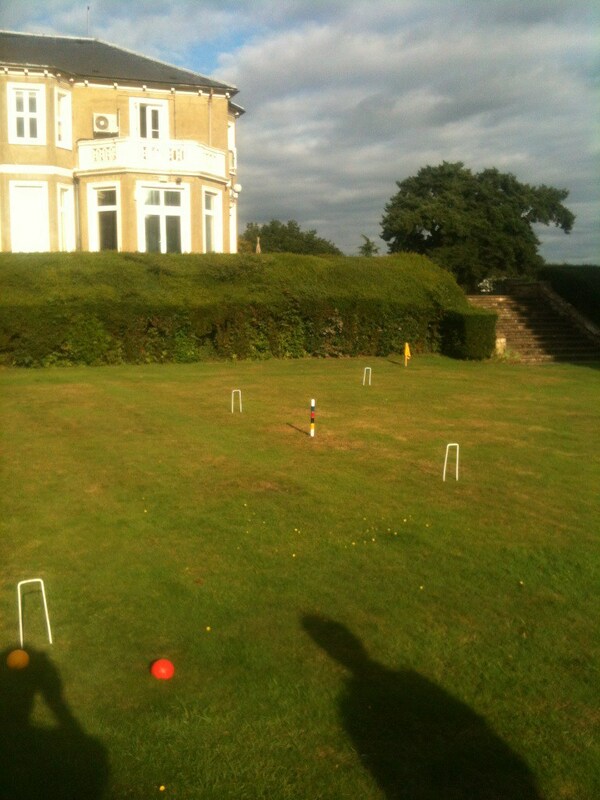 Before this summer I had never before played croquet in my life, so it was with a sense of trepidation that we formed the team Mullard Cosmology Croquet (MC^2), myself together with Dr Jason McEwen. However after the first game I realised that it is a wonderfully game, from quite simple rules very complex matches can result, full of strategy and tactics. The tournament at MSSL is regularly held each summer, and its a really nice way for the different groups in the department to mix. Neville Shane is the tournament organiser and all the information is posted on a nice website here. The game we play is Garden croquet, which is the most common variant of the rules played; teams consist of two players that take it in turns to hit the ball through a series of hoops. The interesting aspect, that causes many complicated playing scenarios, is that if one hits another players ball then this results in two shots, the first of which can be used to move that players ball for example. The tournament structure has two group stages, in which each team plays every other team in the group. The winner and runner up of each group plays the runner up and winner of the other group in the semi-finals, followed by a final show down. The MC^2 team somehow (with a good dose of luck) has managed to get through to the final, with some really close games. The semi-final MC^2 vs. Planetary A-Team croquet lawn. Having such group activities in a department is very important. It creates a sense of community, it builds friendships, all things that a good science department should have. 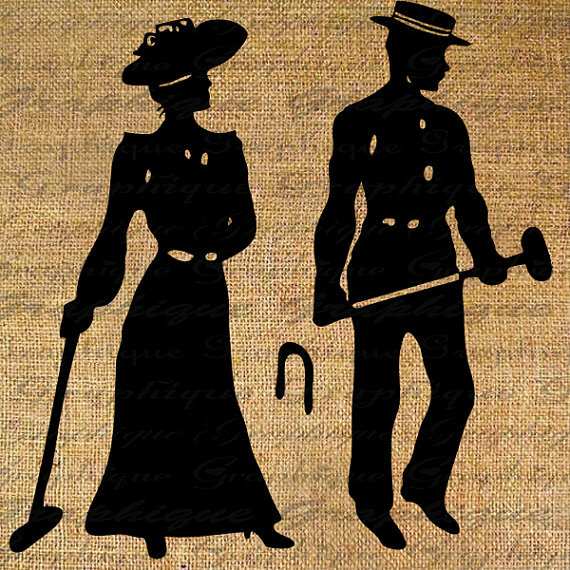 I’ve thoroughly enjoyed my croquet experiences so far, and will certainly look forward to getting out on the lawn next year. Part of the inspiration of the MSSL astronomy blog was that we want to try and convey what an amazing place MSSL is to work. The department is unique in its location, and in this blog we will occasionally share some of our fascination in the environment in which we work. 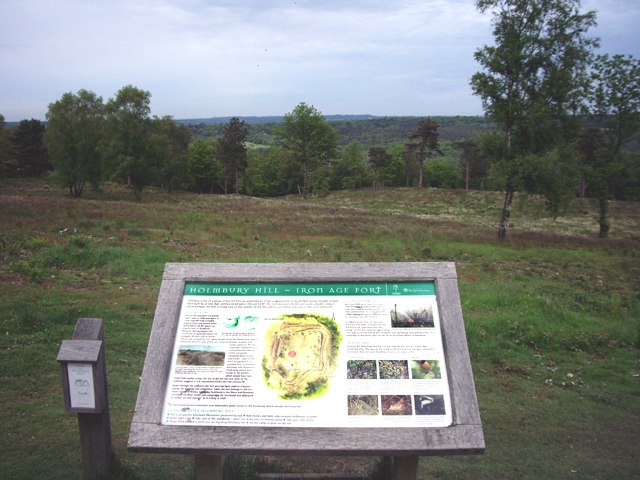 In todays blog post I will talk about some of the ancient history of Holmbury Hill, this first blog on the history of Holmbury Hill should hopefully serve as a taster for more to come. 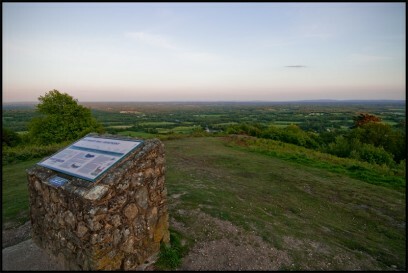 MSSL is situated on Holmbury Hill which has a rich history going back thousands of years! It is a very short (but quite steep!) walk from MSSL, through Hurtwood (named after the Hurtberry – or Bilberry – which grows there abundantly) to the top of Holmbury Hill. Once at the top you are not only rewarded by the amazing views stretching over the Weald to the South Downs, but also with views of the remains of an Iron Age Hill fort. A view over Holmbury Hill Fort. The Iron Age (approx. 1000 BCE to 500 BCE) is the period of human history in western Europe that defines the time when Iron began to widely used in the area. This marked a significant change in technology, from the preceding Bronze Age, because Iron is harder and more resilient than Bronze. At the same time religious, artistic and sociological changes occurred. The most notable Iron Age civilisation were the Romans. On the island of Great Britain the Iron Age was a time of huge transformation, not least is that the region was invaded by the Romans, and preexisting Bronze Age tribes had to adapt. There is a lot of detailed study into this era of human history, here we’ll look at just one aspect of life during that time. Indeed Holmbury Hill is one of the highest in the area at 857 feet, with a relatively steep northern face, so one can appreciate the strategic position that the builders choose. It is thought that the Hill fort was built by Belgic tribes and that it was occupied during the middle Bronze Age. The fort was apparently abandoned around the first century BCE, but for reasons unknown. Surrey and the surrounding counties are a wonderful place to explore. To place the Holmbury Hill fort in context there are several other hill forts in the area, one of the closest is Anstiebury on the neighbouring Leith Hill. Anstiebury was also buit during the Iron Age, but it is not quite as well defined as Holmbury Hill in some respects, and in the intervening 2000 years a village has grown up around the site! Another interesting context for the Iron Age is the network of Roman roads and villas in the area. 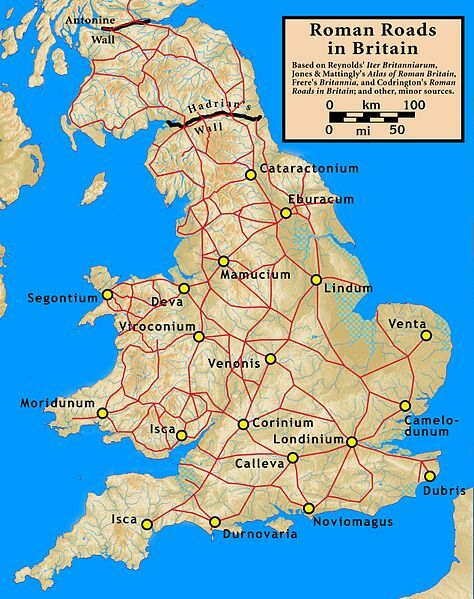 In particular the Roman road Stane Street that ran from the coastal town of Noviomagus Reginorum, or Regnentium, later renamed Chichester to Londinium, later renamed (this translation is easy!) London. In fact there is a spur that comes off Stane Street and runs very close to Holmbury Hill. From http://www.ordnancesurvey.co.uk/oswebsite/opendata/. 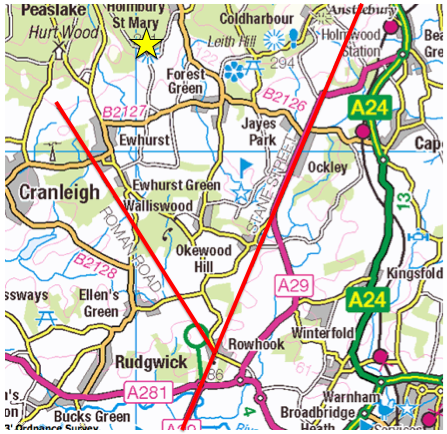 Showing the area around Holmbury Hill (marked with a star) and the Roman Roads marked in Red. As an astronomer and physicist, archaeology presents a fascinating topic to explore. In fact there are many similarities with astronomy, on the technical side for example each field has a single realization of the data set being analyzed: there are only so many artefacts to be found, there are only so many galaxies in the Universe, so both need to use techniques (for example Bayesian statistics – used in Radiocarbon dating, and cosmological parameter inference) that enable a rigorous analysis in these cases. And both astronomy and archaeology inspire people to investigate the Universe around them, and ultimately help to contextualise our lives; placing us within the Universe or illuminating the history of our civilisations and our species. On a warm spring day Holmbury Hill seems like a a very nice place to live, it certainly is a nice place to work. We may never know exactly why people built a hill fort here, or why they left, but over 2000 years later at MSSL we continue to enjoy the environment of Holmbury Hill and can take inspiration from the stories it holds.